. 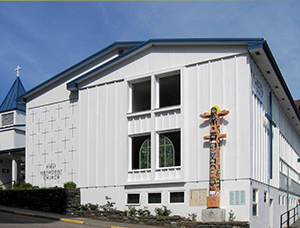 . . to the web site of the First United Methodist Church in Ketchikan. We invite you to come in and look around to see what we have to offer. If you are looking for a church home or just want to visit, you are always invited to participate with us as we, together, seek God and God's kingdom. We are located right downtown at the corner of Main and Grant streets, only a block from the cruise ship berths. Our church has just started an e-Giving program where you may do your church giving via the internet, using your debit or credit card. Just click on the Donate button below, or see the information brochure in the Narthex. Our worship service is at 11:00 A.M on Sunday mornings. Our Sunday School meets September through May starting at 9:45 A.M. We invite you to join us.